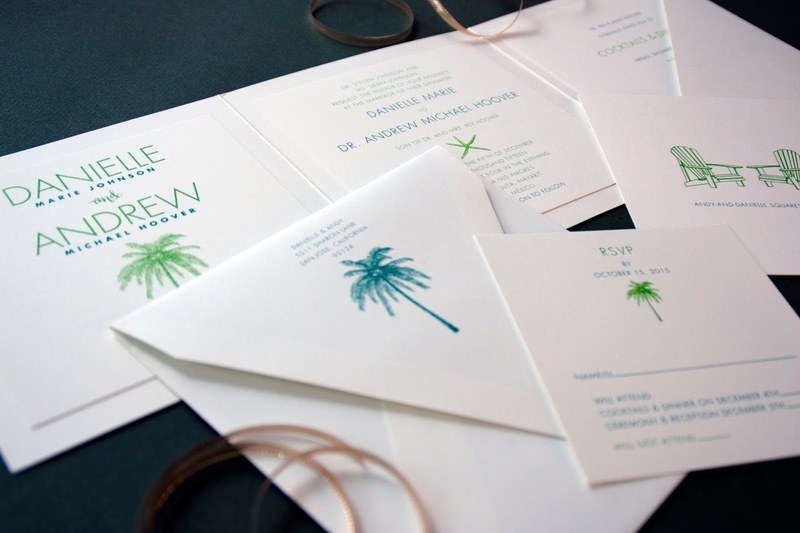 A wedding invitation doesn’t have to be all grand flourishes and black ink to feel elegant. Case in point: Danielle and Andy’s square, accordion-style folder that mixes colorful sans serif typestyles with understatedly playful motifs. “The Vera Wang invitation we decided on was hands down the one that offered the look we wanted,” said Andy. “Clean, simple, stylish and perfect for our destination wedding. All we had to do was put in some personal touches.” Helping them put all their ideas together was Megan of Paper Source Santana Row. Here, they talk to us about the benefits of an in-person experience and why creativity is king (and queen) when it comes to today’s wedding invitations. How did you meet, and how did the proposal happen? 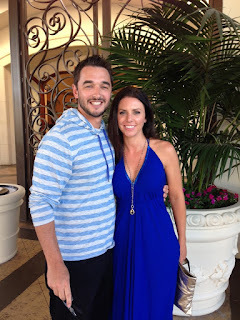 Danielle: Ironically Andy and I met at a wedding—I knew the bride from college and Andy knew both the bride and groom from dental school—the ironic part being that I had a date! Andy: We met at a wedding in Rancho Palos Verdes. Two of my classmates from dental school were getting married and little did I know Danielle went to undergrad with the bride. Danielle was wearing a green dress which may as well been a tracker beam. We went on our first date a month and a half later and haven’t been apart since. D: Andy proposed at our favorite restaurant on HIS birthday! I had been preoccupied with planning a birthday party for him for later that night after dinner, so needless to say I was surprised. His birthday party turned into a surprise engagement party! I was so happy and it was wonderful. A: The element of surprise I feel is lost today. Social media has ruined the concept of a secret. I had to play this one close to my chest; you only get one chance with the woman you love. I bought the ring three months prior to proposing and I didn’t tell anyone. I asked her brother and father permission the night before, and the next night we went to our favorite restaurant for my birthday. After dinner I got down on one knee and asked her to marry me. Tell me about the process of choosing your wedding invitations. Did you have something in mind going into your first appointment, and did that change? D: I wouldn’t say that we had anything in mind going into it. In general Andy and I both like clean, simple lines and designs, so I didn’t ever think it would be a problem, but we didn’t really discuss anything specific beforehand. I had initially seen the Vera Wang invite that we ultimately decided on with my mom, sister-in-law and future mother-in-law, and thereafter Andy and I went in to look at them together and decided. Andy worked with Paper Source to do all the designing from there! A: Danielle and her mom went to Paper Source and did some preliminary scouting. I came in after to look at the ones they liked. The Vera Wang invitation we decided on was hands down the one that offered the look we wanted. Clean, simple, stylish and perfect for our destination wedding. All we had to do was put in some personal touches. Megan was a huge help! 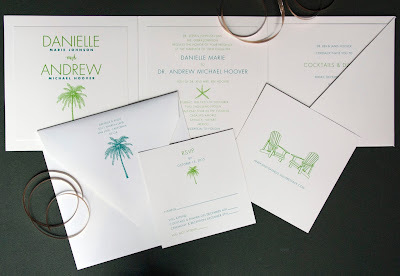 Describe the invitation suite you ended up with and why you fell in love with that design. What drew you to a square format? D: Although I love the square format that we ended up with, I was not initially set on that. What appealed to me was having an invitation without too many loose or separate pieces, which drew me to the “folding” form (for lack of a better term) that we have. I’m really happy with how they turned out. I couldn’t wait until they are mailed out for everyone to see! A: I didn’t expect Megan to have to do so much writing! Every little detail, graphic design, graphic size, font, color and layout had to be written down meticulously. And believe me Danielle and myself changed our minds on some of the details more than once. Megan was great! Do you have any advice for couples on the invitation process? D: For us one of the initial decisions was whether to do the invitations in person with a company like Paper Source (and Vera Wang), or whether to use one of the online portals where we would create and design the invites basically on our own. We decided, of course, on the former, and I’m really happy that we did. Being able to see the actual invitations in person and discuss the various styles and options with the experts at Paper Source made it a much more personal and fulfilling experience. That being said… my advice to a couple would probably be to first figure out the venue where you think you will feel most comfortable. If you want to meet with a person, then you can narrow where to go or who to meet with. If you are comfortable doing it online, then narrow the websites you will use and look at. Andy and I are not too much into the tech/online world so for us the personal experience was the way to go. We are really happy and thankful for all the help from Megan and the other experts at Paper Source, and of course thankful to Vera Wang for the beautiful invites! I’m also really happy and thankful for my amazing fiancé’s invitation design work. A: An invitation can be as gaudy and over the top as you can imagine, or as simple as a post card. It’s about finding something that tells people you want them there for the biggest day of your lives, at the same time giving them a flavor of how you feel about each other and a preview of the celebration. Vera Wang and Paper Source helped us find exactly what we were looking for. What moment are you most looking forward to on your big day? D: Oh I knew there would be a cheesy question in here that I would have to answer (just kidding). Of course the moment I am most waiting for is to say “I do” and be married to the man of my dreams. A: The moment I see her for the first time on our wedding day as she begins her walk towards me. Tell me about your first meeting with Danielle and a little about the process you went through to get to the final decision. I met with Danielle’s family and close friends—they were brainstorming ideas for a destination wedding. She wanted something unique, but with the traditional look of an enclosure, and I showed her different sizes of invitations. We ended up on the accordion look of an enclosure, but still having the square size—Danielle loved it! What questions do you always ask at that first meeting? What time is the event? Where is it going to be held? Head count? What is the color combination/theme? Square invitations seem to be quite popular right now. Why do you think that is? Square is not a traditional size for a wedding invitation. Being a bride, you are making a statement. In some cases, that may be with the invitation. To remember any details that can be missed: wording that pleases all parties of the bride and groom, definite quantity and other card stock that would be needed for the invitation, place cards or menus. Also, to breath and look over the check list! The creativity with printing. Thermography, letterpress and foil (even from the last year) has mad an extreme impact. The options that brides have to make their invitation suite be truly unique is incredible. Screen printing has also been a technique of printing that has gotten some high level of attention this past year. With creativity taken to more advanced levels, there has been so much more variation in the overall look of the invitation suite. Are you a bride or stationer who has a William Arthur or Vera Wang wedding invitation you'd like to have featured in Real Weddings? Email us at concierge@crane.com.